Speakers at the United Nations Commission on the Status of Women 63 on March 13, 2019. Photo credit: Despina Afentouli. UNITED NATIONS, NEW YORK – March 13: The International Federation of Journalists (IFJ) reported that the number of journalists and media workers killed while working in 2018 increased in relation to the past three years. According to the IFJ report, 94 journalists and media workers died in targeted killings, crossfire incidents, and bomb attacks in 2018. The IFJ report noted that other factors contributing to the increase of journalists’ killings include increasing intolerance to independent reporting, populism, rampant corruption and crime, and the breakdown of law and order. NWU President Larry Goldbetter, speaking for the IFJ at the United Nations Commission on the Status of Women 63 (UNCSW63), emphasized that between 2012 and 2016 at least 530 journalists had been killed, and nine in ten cases remained unpunished. “Hundreds of journalists are imprisoned and on a daily basis journalists are attacked, beaten, detained, harassed, forced in to exile and threatened – all as a result of their work and simply for doing their job”, Goldbetter said. He cited the gender dimension to threats against journalists. “There are growing threats to safety with cyber-attacks, online threats and harassment, especially of women journalists – all creating a violence and safety crisis for news professionals”. A report published by the International Women’s Media Foundation (IWMF) and the International News Safety Institute (INSI) said that about 65% of women media workers experienced intimidation, threats or abuse in relation in their work, 22% of women media workers experienced acts of physical violence at work, and that young women under 30 are particularly vulnerable. The survey found the risk of exposure to violence was often greater in journalism and media, in particular where work was informal or precarious, where wages were low, where workers were stopped from joining or forming trade unions and where management accountability was low. Goldbetter said, “In principle, journalists benefit from the same protections afforded by international humanitarian law to all civilians”. However, he added that much more is needed because “international law, conventions, and norms failed to acknowledge that journalists faced greater risks when compared to other civilians.” He said, “There is a strategic advantage to be gained from targeting the media…Those who wish to prevent the dissemination of information and international scrutiny deliberately target journalists”. 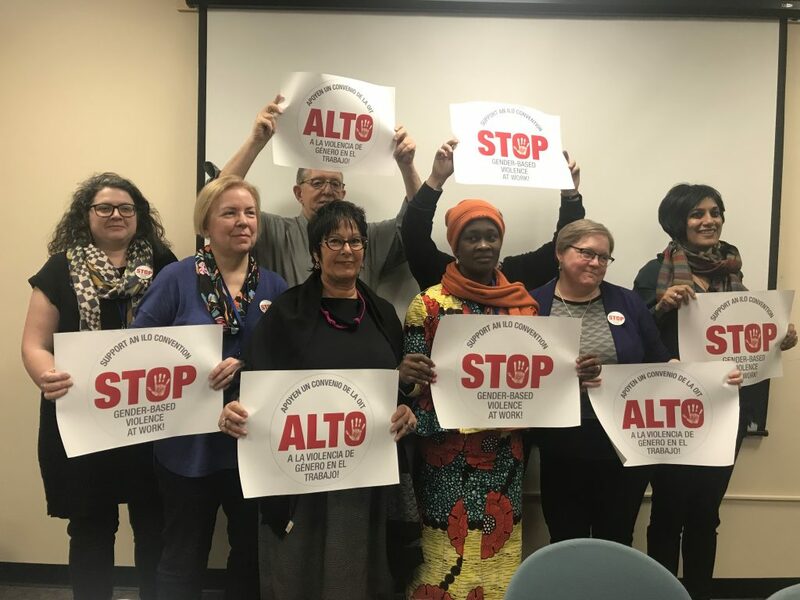 The IFJ Gender Council met in Spain in 2018 and passed a Declaration, condemning gender-based violence and harassment, urging all affiliates pass the resolution, developing and implementing plans for their counties, and lobbying their governments, unions, and employers to support the International Labor Organization (ILO) Convention. The AFL -CIO supported the convention and developed a relevant survey, while the NWU passed a resolution at their 2018 Delegate Assembly and distributed it to the UAW International Union and posted on social media.